Spending time in the water has been a major part of my life. It has shaped my character and given me countless hours of fun, excitement, and life-lasting memories. 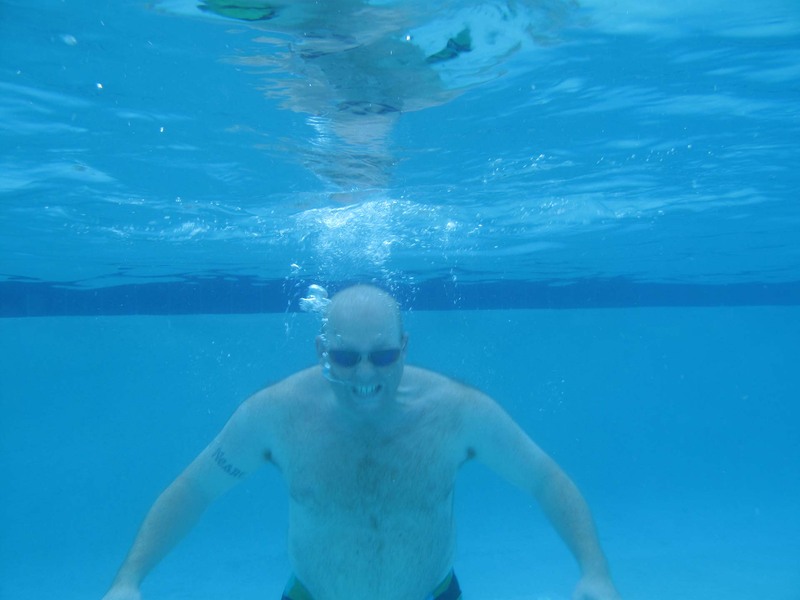 It shouldn’t be surprising that a love of the water was a requirement for my husband. Luckily, Darren agrees that “Darling it’s better / Down where it’s wetter”. Although we both prefer the ocean to a pool, we usually bring along the waterproof camera and make the most of the warmer, less choppy waters. Our personalities are magnified under the water and life appears a little bit brighter. Neither of us mind acting foolish or trying to get that funny, awkward pose. It doesn’t matter who else is around; Darren and I are in our own world when we’re in the water. 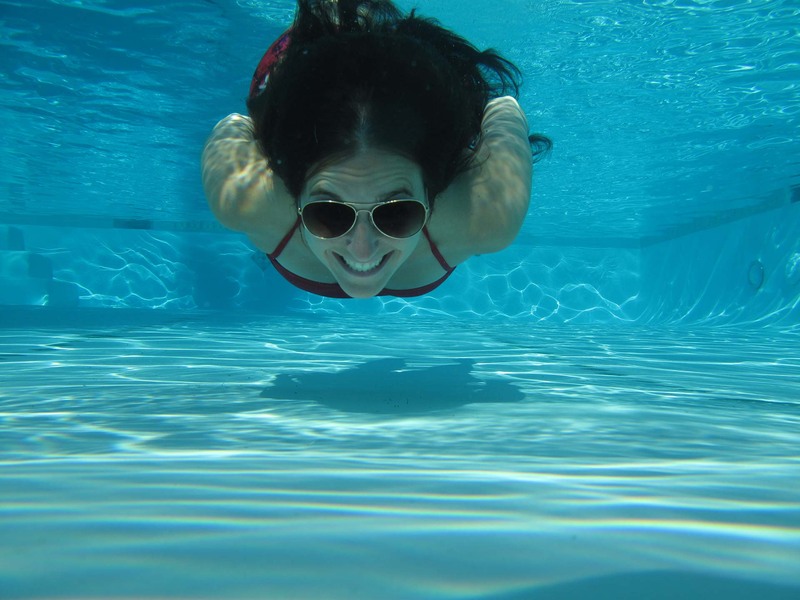 After practicing in several pools, we mastered the “smile” shot under water. The view from below is clear; life is good. It is filled with memorable moments; all we have to do is dive in and take take advantage of them. This entry was posted in Adventure, Family, Marriage, Travel, Uncategorized and tagged adventure, bucket list, Bucket List Publications, Family, fun, Lesley Carter, Outdoors, photo, photography, pool, summer, swim, swimming, swimming pool, travel, vacation by lesleycarter. Bookmark the permalink. Love the sun’s rays through the water. So much joy here, so good to see! How did you take that picture under the water? These pictures are playful and beautiful at the same time. Thanks for sharing! Awesome photos! You make it look easy 🙂 I think I’m still at the pre-mastering-the-underwater-smile-shot phase. Wonderful and inspiring to see you two keep the playfulness and creativity going! Sometimes couples forget to indulge in the simple things that make us smile. Cool photos! Looked like fun! Some shots are amazing, beautiful. Like a pair of dolphins at play and having just as much fun. Excellent! I Love Dolphins, and is a fitting description for the happiness in these pictures. Awesome shots, lots of life and activity :). You look like you are having a blast! You need to add us to your bucket list! That appears to be a lot of fun. I love underwater film/photos. You know how to have fun. i started to feel the “water up my nose” sensation looking at yer pix! (ah like it, anyway) thanx. Great pictures! 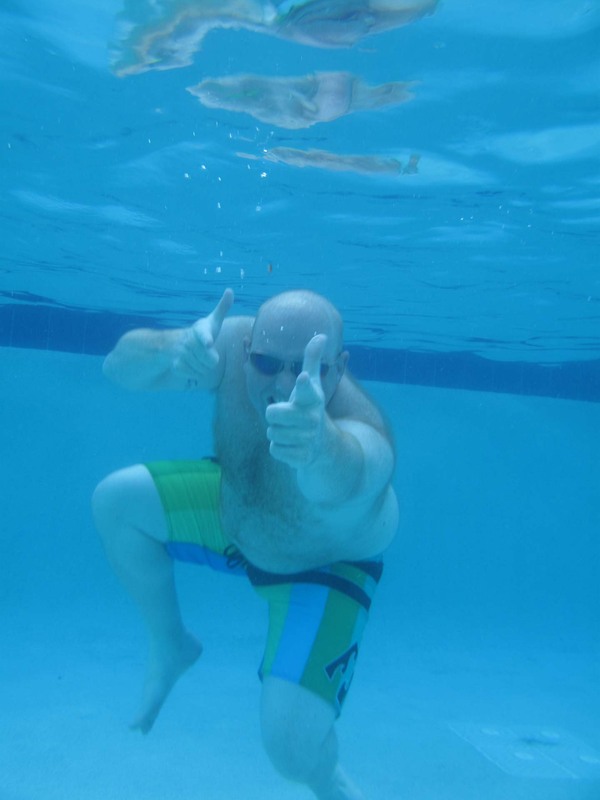 Lookin’ cool in the pool! Looks like you both have a lot of fun!!! Hola and thanks for liking my posting! I’ve been considering the bucket list idea, it’s in the back of my mind but I can see how great it would be put some order into all those wishes and plans..
A comment on your picture: “we’re just big kids at heart” reminded me of my friend’s Sarah’s line. She was about to get married but life unfortunately is pushing her to do something else… please read about Alex and Sarah at http://www.thekaiserchallenge.com and see if you can help spread the word: he was a guy you would have loved, full of life and daring! 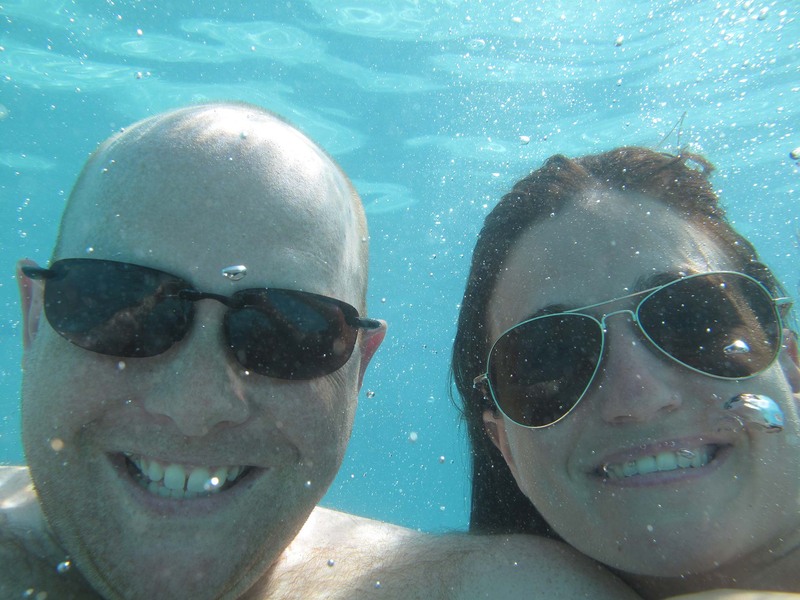 You said: “mastered the “smile” shot under water” – You did, didn´t you! Great pics! So much fun. Keep up the good work. I always find water transports me to a more innocent time where play is the order of the day and inhibitions can wash away with the waves! Nice shots and post! Amazing. I need to get myself a water proof camera! Anything that gives you so much fun must be great. Loved the photos. Seeing you both so silly and happy makes MY day! I love the underwater sunglasses look. It looks like you were born for it. Ah, shucks, now you have me desiring a waterproof camera for our tide-pooling on the Maine coast. Just remembered we have one, or did, but it used film. Remember that stuff? Or getting it processed? Oh, well. Thanks for the reminder to have fun — on and under the water. Great shots! 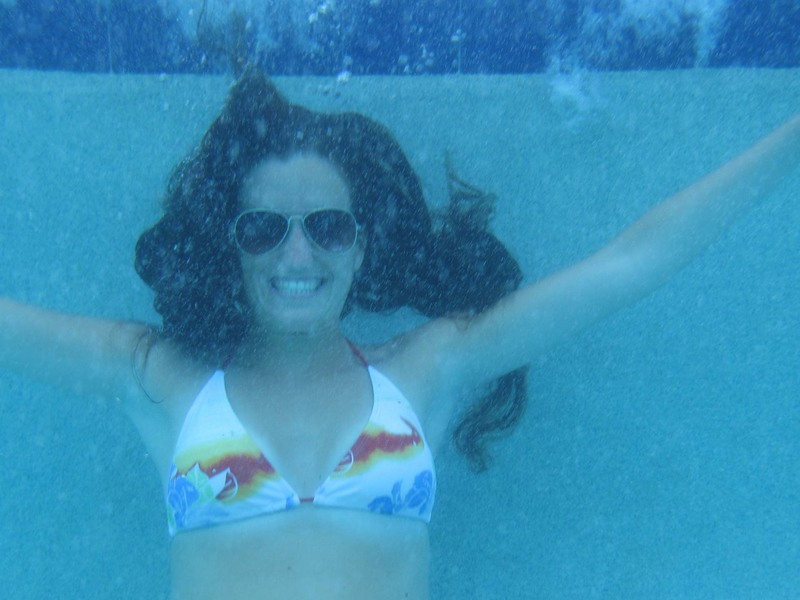 I still haven’t mastered the smile yet underwater. And I love the message of this post. That’s actually pretty cool, my Daughter would get a kick taking these kind of pictures. First of all, thank you for visiting my blog at stevesthinkingspace.wordpress.com recently and “liking” one of my posts! I am so glad I found your blog via your visit to mine. I love what you are doing here with Bucket List Publications!!! 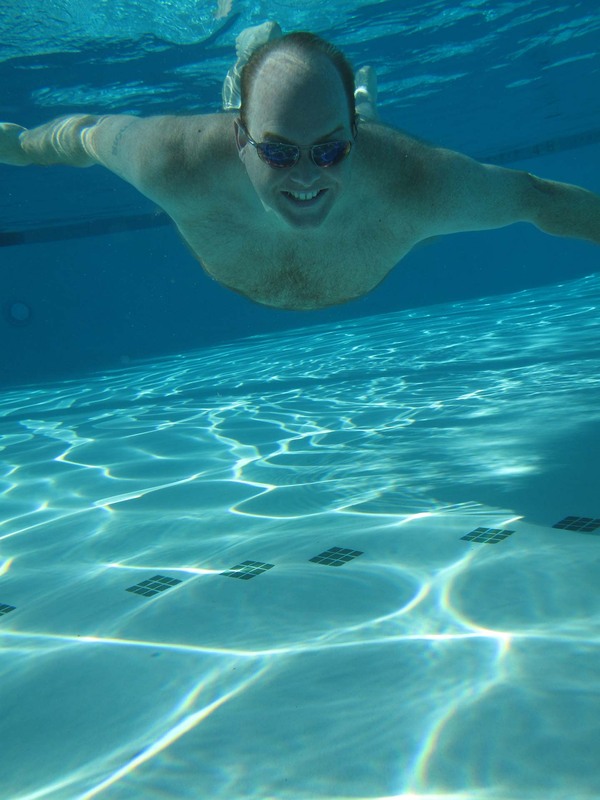 I really like these underwater pics and I enjoy the lightness and fun represented by the whole post! P.S. – How cool that you now live in Charlotte! I live in Concord, NC just north of Charlotte on I-85. It sounds like you are getting to know the area well already but if you need any suggestions or help finding anything do not hesitate to let me know! Keep up the great work that you are doing! I look forward to reading and seeing more of your awesome ideas in the future! totally enjoyed the dip into the pool and WOW, cool shades! I totally have The Little Mermaid in my head now. Sebastian won’t stop singing!! Awesome pictures!!! Love the one with the ‘rainbows’ below you… pretty cool! I enjoyed these photos – you look like a lovely mermaid underwater! You two look like you have a lot of fun and it shows in your pictures. Thanks for posting, made me smile.